Marguerite goes to visit Daddy Bailey in southern California, where she meets his live-in girlfriend Dolores Stockland. Dolores is very well postured, and acts as though she is richer and better than everyone around her. Dolores and Marguerite do not get along; Dolores thinks Marguerite is too tall and improper and arrogant, and Marguerite thinks Dolores is stiff and pretentious. Once again tension arises between Marguerite and one of her parent’s love interests. It’s only natural that Marguerite would resent Dolores’s behavior—recall that one of her first feelings of resentment toward white people is based on their lavish lifestyles. That Dolores thinks Marguerite “arrogant” suggests that Marguerite’s confidence has grown. One night Marguerite goes with her father to a fiesta across the border in Mexico with several of his Spanish-speaking Mexican friends. Marguerite can speak some Spanish but it is clumsy. At the party she loses sight of her father and becomes panicked, believing he has left her, and worrying she has been drugged. She is relieved when she sees his car is still parked outside. She wonders why she had been so afraid of Mexicans. Marguerite has associated racial divisions with fear for so long, and lived with a very rational fear of white people, that she develops an irrational fear of Mexican people. Her ability to recognize her own prejudice shows that she is capable of introspection and critical thinking regarding race—something many white characters in the book fail to do. When she locates her father, he is too drunk to drive, and she must figure out how to get him home. She has never driven a car before but she has watched her mother drive. She triumphantly drives the car, feeling on top of the world, until she crashes into another vehicle. At first the police officers are suspicious of Marguerite, but when they understand the situation, are sympathetic. During the commotion Big Bailey comes to, and charms them both out of trouble. He drives them home in a strangely peaceful silence. This is a kind of familial role-reversal. Marguerite has been a child for the entire book, and she is finally called upon to look after her father—she is notably in control here; she is the caretaker, and her father is helpless. The car crash makes her newfound power fleeting, however. The peace following the incident could be a result of Marguerite and Big Bailey taking comfort in the fact that they’ve returned to the original power structure. Carey, Patrick. "I Know Why the Caged Bird Sings Chapter 30." LitCharts. LitCharts LLC, 5 Dec 2016. Web. 19 Apr 2019. Carey, Patrick. "I Know Why the Caged Bird Sings Chapter 30." LitCharts LLC, December 5, 2016. 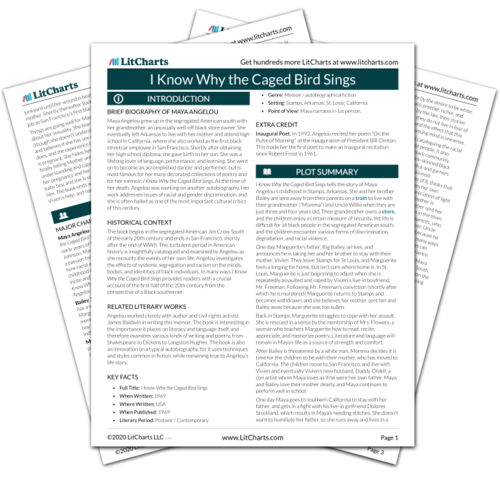 Retrieved April 19, 2019. https://www.litcharts.com/lit/i-know-why-the-caged-bird-sings/chapter-30.